What’s the highest you’ve ever been? Altitude-wise I mean. For me it’s just a little bit shy of 7,000m or 23,000ft. I grew up at a low elevation, in the middle of Germany, and even though I spent plenty of time in the foothills of the Alps as a kid hiking and skiing I never once approached the 14,000ft mark until shortly after my 25th birthday. But that’s a different story (which you can read on REI’s Coop Journal here). The reason I want to talk about altitude is because of the experience that Kat and Tara and I had on our Mera Peak climb last month. We had a fantastic expedition all in all, but our first summit attempt was cut short by an altitude scare. Take a look below for the brief summary of what happened as I described it on Instagram a little while ago. Yes, altitude struck. 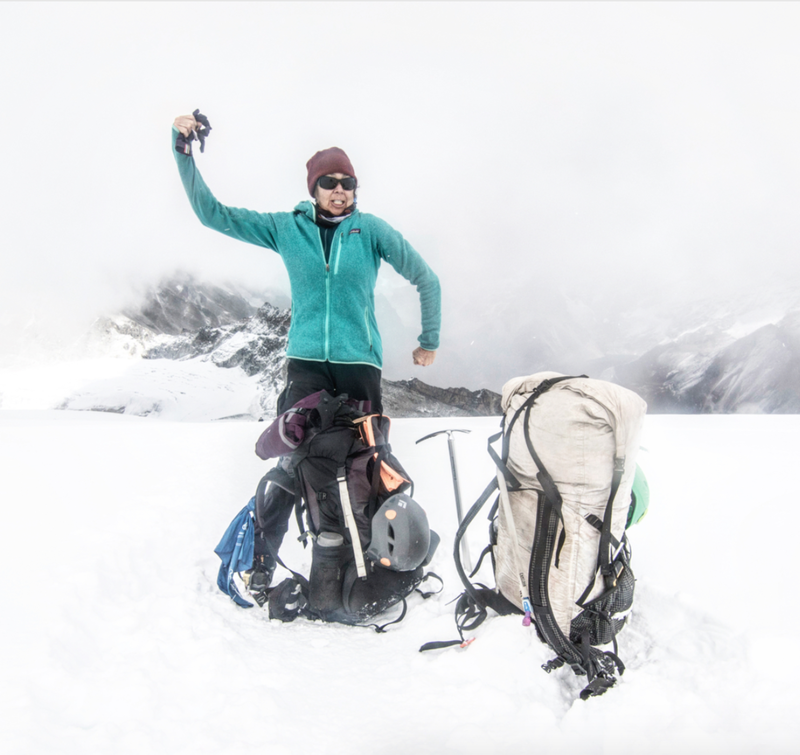 Kat knew what she might be in for, because she had had a similar experience in Ecuador on her 4-day Cotopaxi trip. 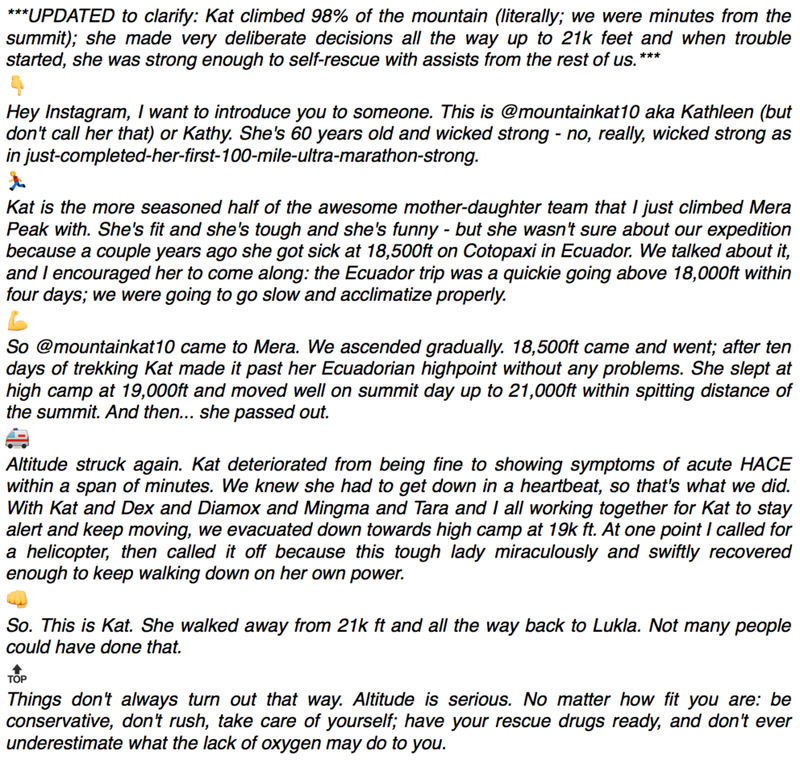 I knew what we might be in for, too, because Kat had told me of the Cotopaxi incident; and yet, after listening to her story and understanding the parameters of her Ecuador experience I still encouraged her to attempt Mera: because slow and gradual acclimatization can make all the difference. Kat’s condition changed rapidly. Leading up to 21,000ft she had - by her own account - no headache, no nausea, and only the occasional mild bout of dizziness. Then, from one minute to the next, she was slurring her speech and had to sit down. She was lucid enough, and the whole team knew enough of her history with altitude, that we were all clear she had to descend immediately. Thanks to Kat’s tremendous physical and mental strength she managed to descend on her own to feet with assistance from her daughter Tara, Mingma Sherpa, and myself. While fitness and training may not impact your susceptibility to altitude, they sure do help in extricating yourself from bad situations! Prior experiences with acute mountain sickness are the biggest predictor for future episodes; everyone’s ability to acclimatize and function at altitude is different, and seems to be largely driven by your DNA (Example: I have a super fit ultra-running friend who can run a hundred miler no problem, but develops acute mountain sickness as soon as he ascends above 10,000ft). There is only so much you can do in terms of acclimatization schedule, climbing strategy and emergency preparedness. Even if you haven’t yet found your limits at altitude, be aware that they do exist - be it at 14,000ft or at 20,000ft or maybe even at the summit of Everest, who knows. But we all have a limit on how high we can go; if you find yours, make sure you and your team know how to respond - and get back down safely, quickly.